Forgive me, I'm doing this all out of order! 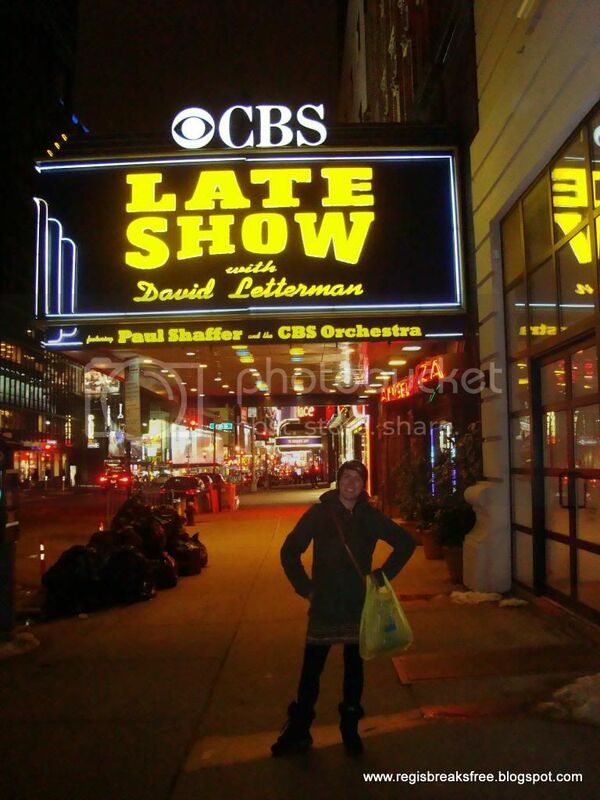 I know I already blogged Central Park, but technically I visited Times Square first. I arrived at LaGuardia Airport in the evening, and was greeted (after a half hour of mild concern that I would be left to find my own way in the world) by two Steves and a welcome banner. This is when I learned that the Alberta side of our team was stuck in Minneapolis for the time being! View from the roof of the Salvation Army building! We drove past the Rockefeller Center and through Times Square on our way to the Salvation Army building where we would be staying that week. What an experience! 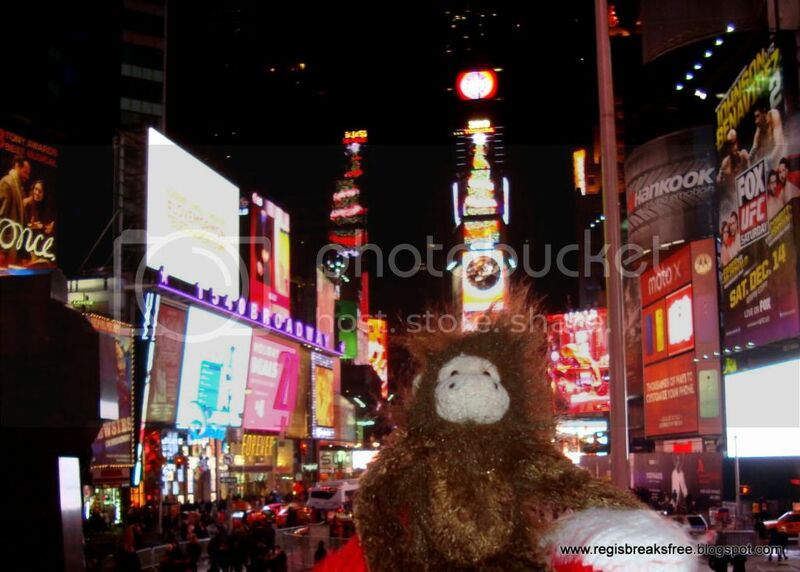 NYC is such a crazy place, especially Times Square! 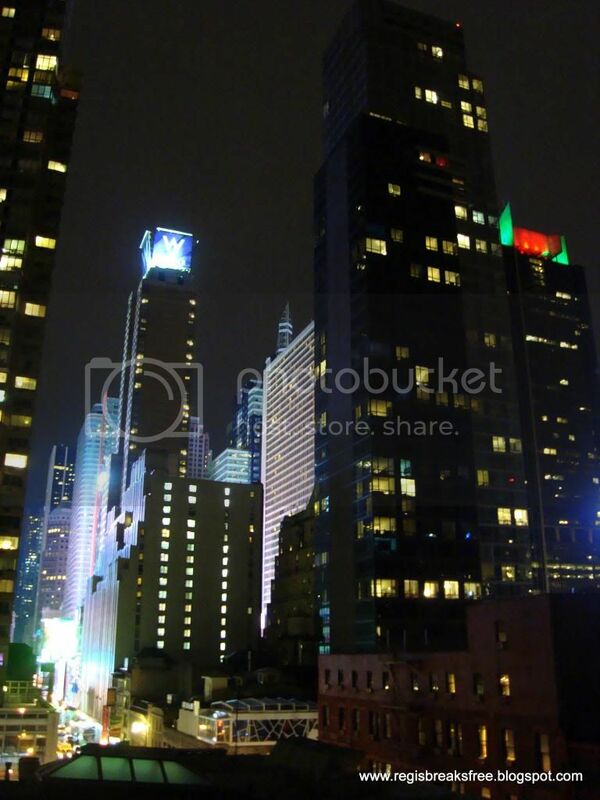 Even in the middle of the night, the lights of the billboards make it seem almost like daytime. Another check on the bucket list! So, what is Times Square? This is a question I realized I didn't really know the answer to. I knew it had big neon signs, and that's about it. Q. Is Times Square a square? A. No. Most of Manhattan is designed as a grid, with Broadway, the proverbial black sheep, cutting through it all at an angle (Friggen Broadway. Thinks it's such a big deal). Times Square is the triangular pedestrian-only zone that results from the intersection between Broadway and 7th Ave. You will know it when you see it! It truly is sensory overload, especially in the middle of the day or evening when the crowds are the thickest. First of all there are the lights. Incredible. Then the chaos of weaving through pedestrians and cars, bumping into people, trying not to lose sight of your group, being heckled and hassled by salesmen on the street, evading terrifying mascots...it might sound terrible when you think of it like that, but its actually quite exhilarating! Another bonus to the Times Square area is unexpected surprises like walking past this! Your ears are assaulted by the sounds of honking cars (New Yorkers honk constantly), wailing sirens of emergency vehicles, music from the stores, the shouting of the ticket salesmen, and the general babble and hum of the crowd, much of which is taking place in languages from across the world! 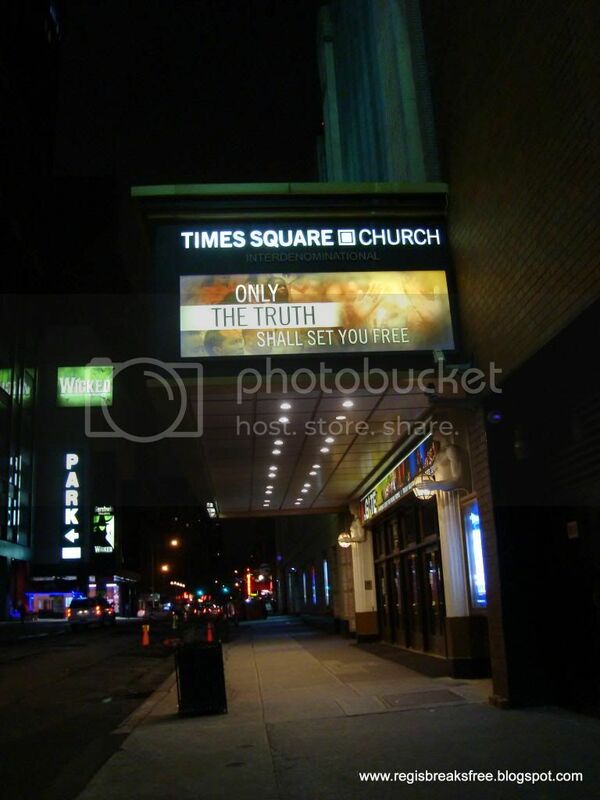 Times Square Church of David Wilkerson's "the Cross and the Switchblade" fame. 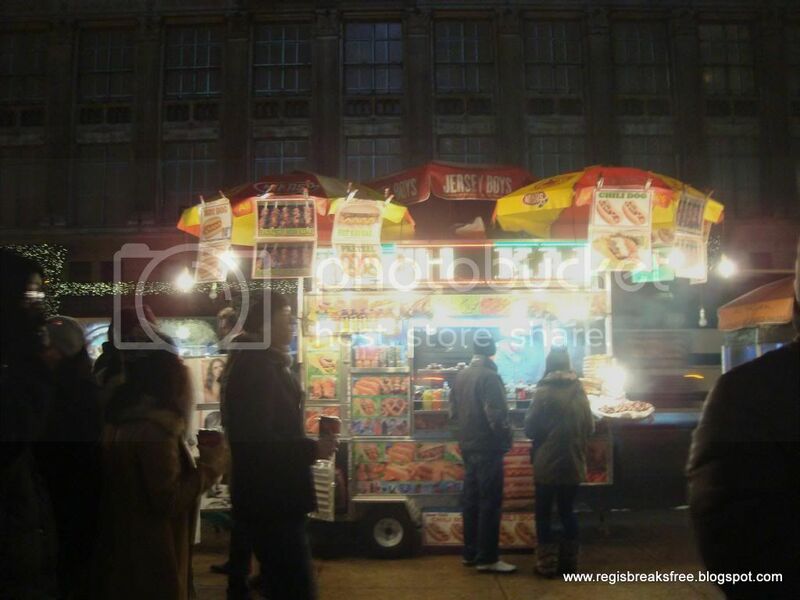 The smell of food from the street vendors will make your stomach growl hungrily at any time of the day. There are usually 2 or more per street corner, with the choices ranging from chili dogs to bagels with cream cheese to kebabs. I unfortunately never tried anything because of my gluten intolerance issues...but it looked good! 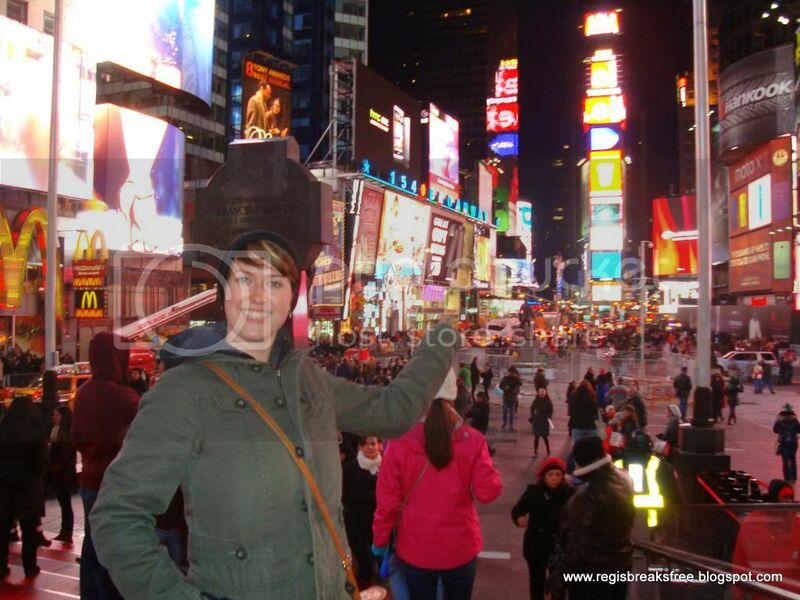 Visiting Times Square at night was a great way to kick off the trip! I'm not usually a big city type of girl, but this was truly an experience unlike any other. 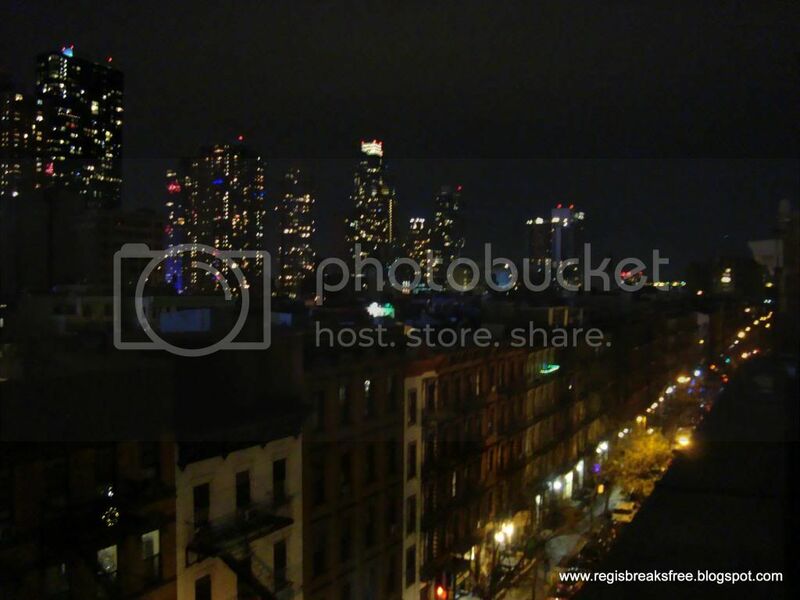 Another view from the roof, looking towards Times Square. It looks fantastical! Thanks for informing me on the un-square-ness of Times Square! And "Friggen Broadway." I chuckled to myself. I can see why New York holds a certain attraction.. it would be quite the experience, although I don't like the idea of losing sight of my band of people in the middle of a crowd! Time Square Church - cool! Didn't realize it was right there.. that's been around for a long time... since the 50's, I think! I took that pic for you, Mom! Its not right IN Times Square, but its very close. @Kriss- awww you commented! I like you even more now.